A BT game, or what? You might like to play this BT game received via an email today. It looks like updated space invaders and it is quite entertaining. However, its really a survey in disguise and you will also have to agree to BT’s terms and conditions as there is carrot of a prize. Methinks that this viral marketing initiative has been passed through BT’s large lawyer department! Anyway, this is what the email said with the advertising for BT’s ExpertIT service removed. Enjoy! 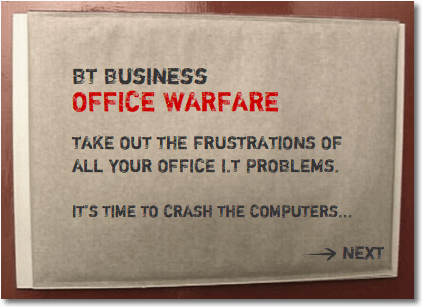 BT Business IT Manager invites you to take revenge on your IT problems with the fast paced game Office Warfare, and win a fantastic day out for your and your colleagues. It’s man against machine, or machine against man – if you can’t hack it! It’s time to crash the computers. Click on the link to play. This entry was posted on Friday, January 19th, 2007 at 14:27 pm and is filed under All, Ephemera, Networks. You can follow any responses to this entry through the RSS 2.0 feed. You can leave a response, or trackback from your own site.